There were numerous rarities hidden among the offerings in auction house Numismatik Lanz’s auction catalogue 154, and collectors didn’t fail to find them. They were also clearly willing to spend a bit more in the process. There are those auctions where the average collector resigns himself to simply admiring the pretty pictures; and then there are those where the collector can actually be a part of the action, maybe even acquiring the odd rarity or two for the own collection. The Auktionshaus Lanz very deliberately puts the focus on the collector – with their starting price at 60 %, auction participants can pick up a bargain. The fact that prices for rarities still soared, however, isn’t the least bit surprising; experienced collectors simply know just how rare a piece really is. Consequently, the particularly rare coins in all categories quickly skyrocketed. 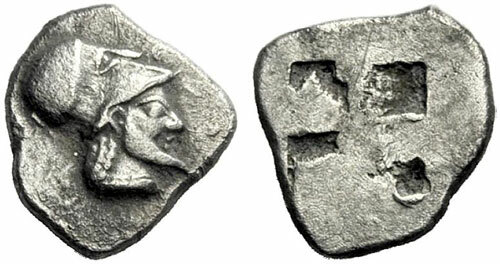 As an example, let’s look at a few pieces from the Greek coins category. The very rare and almost extremely fine great bronze from Kentoripe went for 2,950 Euro (1,500 EUR), while the extremely fine diobol from Aenia featuring an archaic man’s head climbed from a starting price of 420 EUR to a final sale price of 2,400 EUR. A rather unimpressive bronze from Sparta originally purchased in 1952 for just 18 schillings climbed even higher percentage-wise, starting at 210 EUR and ending at 1,600 EUR. Several other pieces went much the same way, including an extremely fine early electrum trite made according to the Milesian standard with a final price of 3,500 EUR (500 EUR), an almost extremely fine electrum hekte, unmistakably attributed to Miletus (300 EUR / 3,000 EUR) and an extremely fine lydo-milesian trite with a facing panther’s head (1,000 EUR / 3,600 EUR). 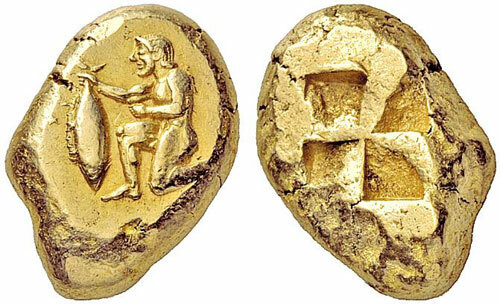 The most expensive piece of the Greek category and, indeed, of the entire auction, ended up being a showpiece of a Cyzican electrum stater. It was called at 30,000 EUR and sold for 54,000 EUR. Sales of Roman coins followed a similar pattern. The exceedingly rare legionary denarius of Marcus Antonius, already steeply estimated at 5,000 EUR, rose yet again to 6,250 EUR. Rarity and quality came together in a denarius of Augustus combined with the Secular Games. The perfectly centered, extremely fine piece with the hat of flamen Dialis and two schields of Salii went for 6,500 EUR (3,000 EUR). Connoisseurs won’t be at all surprised that the Severan coins from Alexandria turned out to be completely underestimated. A very rare but not particularly attractive tetradrachm of Septimius Severus that depicts two boys on the reverse, for example, sold for 1,300 EUR, far above the estimated 200 EUR. Similarly, a tetradrachm of Iulia Domna sold for 1,600 EUR instead of the estimated 300 EUR. The results for two rare Siliquan coins turned out to be quite surprising, however. One, of Constantin the Great in almost mint condition, reached 4,500 EUR (2,000 EUR), and one of Constantius II as Caesar in almost extremely fine condition reached 2,200 EUR (300 EUR). Meanwhile, the price realized by the gold medallion of Constantius II as Caesar in the weight of two solidi was not the least bit surprising. The medallion’s magnificent pedigree – it was purchased by Karl Pollak from a Graz jeweler on May 26, 1956 for 1,100 schillings – and its perfect condition certainly warranted its estimate of 20,000 EUR. The purchaser won the bidding at 21,000 EUR. Connoisseurs also appreciate rarity in Byzantine coins, preferably those that are also in good condition. Take, for example, a solidus of Irene – a perfectly centered perfect specimen and unpublished die variety – which sold for 12,000 EUR instead of the estimated 8,000. Experienced collectors know enough, however, to value rarity in and of itself – a very rare tremissis of Iustinianus II with a scratch still brought 1,600 EUR (1,000 EUR). The second part of the auction was dedicated to the Karl Pollak Collection, a remarkable ensemble in which the prices, acquisition dates and generally also the origins of almost every piece were known. Although spectacular, it was also a collection quite typical of those put together prior to the coin boom of the 70s – a time when a collector placed far greater importance on a piece’s rarity than on its condition. The auction itself was testament to the fact that there are still many collectors in this day and age that haven’t fallen victim to so-called “condition fetishism.” Nearly all pieces from the Habsburg Empire and Austrian coins, in particular, were sold, with several pieces even rising to more than double their original estimates. Some examples were the almost extremely fine Leopold I thaler from 1691 from Kremnitz (purchased in 1954 for 25 schillings / 500 EUR / 1,010 EUR), an FDC Joseph I thaler from 1706 from Graz (purchased in 1939 for 6 reichsmark / 800 EUR / 1,800 EUR) and an almost FDC Joseph I quarter ducat from 1711 from Kremnitz (purchased in 1953 for 120 schillings / 1,000 EUR / 3,600 EUR). The 19th century was the prime focus of the collection, and there were certainly some rarities in outstanding condition to be found, such as a Franz Joseph I 4-ducat piece from 1865 from Vienna (purchased in 1956 for 500 schillings / 2,500 EUR / 7,250 EUR). A very special Karl Pollak showpiece was the thaler of Johann Ulrich von Eggenberg, minted in Prague in 1629, which was acquired by the collector in 1956 in the Dorotheum. He paid 700 schillings at the time. Now, the lot had been estimated at 9,000 EUR and sold for 13,000. As was expected, there was great interest in Pollak Collection coins from the German Empire. The most expensive one turned out to be an FDC Heinrich XIV of Reuss (younger line) 10 mark piece minted in Berlin in 1882 (20,000 EUR / 22,000 EUR). A few surprises were in store, however, in the foreign coins section, where several Pollak Collection pieces were also tucked away. Some of these had clearly been underestimated, such as an almost FDC Ludwig XIV half écu from 1792 from Strasbourg that rose from an estimate of 500 EUR to a very substantial 9,500 EUR. A very fine, undated (1700) scudo d’oro of Hercules and Cornelius Pepoli from their reign Castiglione de’ Gatti not from the Pollak Collection had also been underestimated – the very rare piece had been appraised at 5,000 EUR but then sold for 13,000 EUR. The price realized for a Russian 1 ½ ruble piece from 1839 from Saint Petersburg was even more dramatic. The extremely fine commemorative coin on the occasion of the consecration of the Borodino Memorial climbed from 3,000 EUR to 16,000 EUR. In comparison, the trial pieces of Russian circulation coins from 1956 had been very accurately estimated. Uniformly appraised at 7,000 EUR, the bids ranged between 7,500 and 9,500 EUR. The auction concluded with a fine series of coins of the Vatican also from the Pollak Collection, the prize piece being a piastra from 1634, minted under Urban VIII, which was added to the collection in 1952 for 150 schillings. The new owner obviously had to pay quite a bit more – the merely very fine, burnished piece with a solder mark started with an opening price of 240 EUR, only to end with a winning bid of 2,800 EUR. The next auction is scheduled to take place in mid December.